But how many of us would describe Father Kayser’s impact upon our lives as ordinary? His gift was to ask questions of us, to call us out of our complacency and to encourage us to be better humans than maybe we thought possible. Some have referred to his “prophetic voice.” It was real. It was revolutionary. And it was powerful. If Father Kayser himself was ordinary, it was in the sense that he was a complicated figure. He was a great man, but he was a man. He could be glowing and generous. He could also be short-tempered. Father Kayser had personal struggles, as all of us do, and I think they helped him connect with and help the individuals he encountered at the South Dakota Human Services Center and the Yankton Federal Prison Camp. He knew he could learn from them and did. He was an advocate for all human beings despite whatever differences or shortcomings they may have in the eyes of others – and in their own eyes. He recognized human frailty and the difficult decisions that come with life, and he offered understanding and encouragement to individuals struggling with those realities. When he saw mistreatment or neglect of mental patients or prisoners, he took action. He raised his voice. His advocacy wasn’t always popular with those around him, and he sometimes paid a price. But he couldn’t look the other way. Whatever these men and women were suffering from or might have done, he believed they deserved to be treated with kindness and respect. I know how deeply he loved the Catholic faith and the Church, and yet he often criticized the hierarchy of the Church as too patriarchal and certain of itself. No human institution was beyond criticism. He believed women should be allowed as priests and actively supported that effort. He refused to condemn homosexuals. In other words, he was not afraid to express his deeply-held Catholicism in ways that some might deem controversial or even at odds with the Catholic Church. He scoffed at the idea that faith could exist in a vacuum. 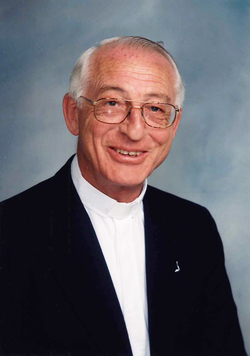 Social justice was a foremost concern for Father Kayser. As a member of the South Dakota Peace and Justice Center, for example, or the Catholic Worker Movement, he was committed to nonviolence, prayer, and hospitality for the homeless, exiled, hungry and foresaken. He protested injustice, war, racism and violence of all forms. Father Kayser could be found at protests against nuclear weapons and the death penalty. He opposed drone warfare. He recognized the institutional mechanisms that make poverty and suffering inevitable. He was fond of quoting the fascinating British economist E.F. Schumacher, a man whom Father Kayser had met when he toured South Dakota in the 1970s and from whom he found much inspiration. Before a crowd in Danville, Ohio, in May of 1980, Father Kayser expressed why he believed family farms were so important while criticizing industrial farming. Later in the speech, he addressed the ills that had befallen the United States and which, I would add, have only become much, much worse in the last 35 years. “While we still talk about being good, hard workers and making it, whether in town or country, we have had to change our whole value system, our way of looking at life, at the world around us. We too often talk about free enterprise as if it were still working. I’m sorry. At this point, I want to take a moment to thank Father Kayser for not suing me for plagiarism during his life, because, looking over these speeches now, I’ve clearly been stealing from his body of work. I plead ignorance! I admired Father Kayser for all of the above reasons and considered him a mentor both politically and spiritually. But there is something more I need to add, because I think it is important. Those who know me have joked about the fact that I’m in a church delivering a eulogy for a man of such deep Catholic faith. Why? Because I don’t subscribe to any faith. I am, at best, an agnostic. And yet, I considered Father Kayser a spiritual brother and guide. I never saw Father Kayser use Catholicism as a litmus test. He did not allow it to be a barrier to communing with another human being. He refused to believe his faith, or any faith, laid claim to the absolute truth. And he realized goodness and truth could come from many backgrounds and schools of thought. I think that is why my own approach to life was never an issue between us. In fact, from my perspective, I think it drew us closer. In the often polarized country in which we now live, I think there is a lesson and a beauty to that fact. Returning to 2009, when Father Kayser was looking back at his 50 years in the priesthood, he quoted a priest who was asked what he had learned during his life. Father Kayser was a man who dared to dream by day. And the world he has left behind is a better place for it.